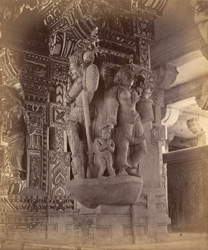 Photograph of pillars with sculptured figures in a colonnade of the Ramalingeshvara Temple, Rameswaram in Tamil Nadu, taken by Nicholas and Company in c.1884, from the Archaeological Survey of India Collections. This temple is situated on the sacred Hindu island of Rameswaram, connected to the mainland by a causeway. The site is believed to be related to the story of Rama of the Ramayana epic. It was founded during the Chola period but belongs mostly to the Nayaka period of the 17th and 18th centuries. The complex is contained within high walls entered through tall towered gopuras on three sides. These gateways lead to an exceptionally long colonnade, with over 4000 carved granite pillars, that surrounds the intermediate enclosure. This view shows one of the pillars from the colonnade carved with figures. This temple, which contains one of the holiest shrines in India, is situated on the sacred Hindu island of Rameshwaram believed to be related to the story of Rama of the Ramayana epic. It was founded during the Chola period but belongs mostly to the Nayaka period, 17th and 18th Centuries. The complex is contained within high walls entered through tall towered gopuras. The principal feature of the temple is the 4000 feet long colonnade with over 4000 carved granite pillars. This view shows a pier of a colonnade carved with figures.